This law is the most misunderstood (though probably most employed) Law of the three since it suggests at first sight that everything is in a permanent deadlock ! Writers of Mechanics textbooks hasten to point out that the action and reaction apply to two different bodies, call them body A and body B. The Third Law claims that the force exerted by body A on body B is met by an equivalent force, equal in magnitude but opposite in direction, which body B exerts on body A. Does this get round the problem? Not entirely. The schoolboy or schoolgirl who somehow feels uneasy with the Third Law is on to something. What is either completely left out of the description, or not sufficiently emphasized by physics and mechanics textbooks, is the timing of the occurrences. It is my push against the wall that is the prior occurrence, and the push back from the wall is a re-action. Without my decision to strike the wall, this ‘reaction’ would never have come about. What in fact is happening at the molecular level is that the molecules of the wall have been squeezed together by my blow and it is their attempt to recover their original conformation that causes the compression in my hand, or in certain other circumstances, pushes me away from the wall altogether. (The ‘pain’ I feel is a warning message sent to the brain to warn it/me that something is amiss.) The reaction of the wall is a restoring force and its effectiveness depends on the elasticity or plasticity of the material substance from which the wall is made — if the ‘wall’ is made of putty I feel practically nothing at all but my hand remains embedded in the wall. As a reliable author puts it, “The force acting on a particle should always be thought of as the cause and the associated change of momentum as the effect” (Heading, Mathematical methods in Science and Engineering). In cases where the two bodies remain in contact, a lengthy toing and froing goes on until both sides subside into equilibrium (Note 1). For the reaction of the wall becomes the action in the subsequent cause/event pair, with the subsequent painful compression of the tissues in my hand being the result. It is essential to realize that we are in the presence not of ‘simultaneous’ events, but of a clearly differentiated event-chain involving two ‘objects’ namely the wall and my hand. It is this failure to distinguish between cause and effect, action and reaction, that gives rise to the conceptual muddle concerning centrifugal ‘force’. It is a matter of common experience that if objects are whirled around but restrained from flying away altogether, they seem to keep to the circumference of an imaginary circle — in the case of s spin dryer, the clothes press themselves against the inside wall of the cylinder while a conker attached to my finger by a piece of string follows a roughly circular path with my finger as centre (only roughly because gravity and air pressure deform the trajectory from that of a perfect circle) . At first sight, it would seem, then, that there is a ‘force’ at work pushing the clothes or the conker outwards since the position of the clothes on the inside surface of the dryer or of the conker some distance away from my finger is not their ‘normal’ position. However, the centrifugal ‘force’ (from Latin fugo ‘I flee’) is not something applied to the clothes or the conker but is entirely a response to the initiating centripetal force (from Latin peto ‘I seek’) without which it would never have come into existence. The centrifugal ‘force’ is thus entirely secondary in this action/reaction couple and, for this reason, is often referred to as a ‘fictitious’ force — though this is somewhat misleading since the effects are there for all to see, or rather to feel. Newton does in certain passages make it clear that there is a definite sequence of events but in other passages he is ambivalent because, as he fully realized, according to his assumptions, gravitational influences seemed to propagate themselves over immense distances instantaneously (and in both directions) — which seemed extremely far-fetched and was one reason why continental scientists rejected the theory of gravitational attraction. Leaving gravity aside since it is ‘action at a distance’, what we can say is that in cases of direct contact, there really is an explicit, and often visible, sequencing of events. In the well-known Ball with Two Strings experiment (Note 2) we have a heavy lead ball suspended from the ceiling by a cotton thread with a second thread hanging underneath the ball. Where will the thread break? According to Newton’s Laws it should break just underneath the ceiling since the upper thread has to support the weight of the ball as well as responding to my tug. However, if you pull smartly enough the lower thread will break first and the ball will stay suspended. Why is this? 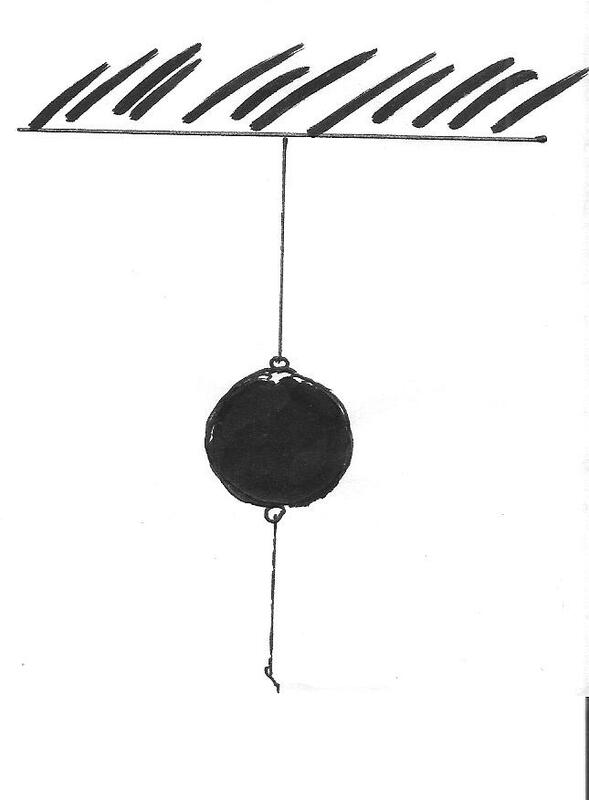 Simply because there is not ‘time enough’ for my pull to be transmitted right up through the ‘ball plus thread’ system to the ceiling and call forth a reaction there. And, if it is objected that this is a somewhat untypical case because there is a substantial speed of transmission involved, an even more dramatic demonstration is given by high speed photographs of a golf club striking a ball. We can actually see the ball still in contact with the club massively deformed in shape and it is the ball’s recovery of its original configuration (the reaction) that propels it into the air. As someone said, all (mechanical) propulsion is ‘reaction propulsion’, not just that of jet planes. In Ultimate Event Theory the strict sequencing of events, which is only implicit in Newtonian mechanics, becomes explicit. If we leave aside for the moment the question of ‘how far’ a ksana extends (Note 3), it is possible to give a clearcut definition of simultaneous (ultimate) events : Any two events are simultaneous if they have occurrence within the same ksana. A ‘ksana’ (roughly ‘instant’) is a three-dimensional ‘slice’ of the Locality and, within this slice, everything is still because there is, if you like, noit enough ‘time’ for anything to change. Consequently, an ultimate event which has occurrence within or at a particular ksana cannot possibly influence another event having occurrence within this same ksana : any effect it may have on other event-chains will have to wait until at least the next ksana. The entire chain of cause and effect is thus strictly consecutive (cases of apparent ‘causal reversal’ will be considered later.) In effect when bodies are in contact there is a ceaseless toing and froing, sort of ‘passing the buck’ from one side to the other, until friction and other forces eventually dampen down the activity to almost nothing (while not entirely destroying it). Note 1 Complete static equilibrium does not and cannot exist since what we call ‘matter’ is always in a state of vibration and bodies in contact affect each other even when apparently completely motionless. What can and does exist, however. is a ‘steady state’ when the variations in pressure of two bodies in contact more or less cancel each other out over time (over a number of ksanas). We are, in chemistry, familiar with the notion that two fluids in solution are never equally mixed and that, for example, oxidation and reduction reactions take place continually; when we say a fluid is ‘in equilibrium’ we do not mean that no chemical reactions are taking place but that the changes more or less equal out over a certain period of time. The same applies to solid bodies in contact though the departures from the mean are not so obvious. Although it is practical to divide mechanics into statics and dynamics, there is in reality no hard and fast division. Note 2 I am indebted to Den Hartog for pointing this out in his excellent book Mechanics (Dover 1948).